OBDIIGroup--Best Supplier for Auto Diagnose Tools, Best Price! Best Service! DA-VINA 2534 Jaguar Land Rover Approved SAE J2534 Pass-Thru Interface OBDIIGroup--Best Supplier for Auto Diagnose Tools, Best Price! Best Service! You can use the original software to update our DA-VINA 2534. The Best tool for Jaguar Land Rover! Computer requirement: 4 nuclear WIN7 or XP 32-bit systems, More than 20GB of Hard Disk partition C.
* It supports the latest LandRover and Jaguar including 2014 and supports all the future LandRover and Jaguar. * Works more steady than VCM, VCMII, and JLR Mogoose cable, it will not lose connection during the process of programming. * install these on the SDD Laptop. * Connect the J2534 device to the vehicle OBDII connector (the device powers from the vehicle). * Connect the 12ft USB cable to the DA-VINA and the other end to the SDD Laptop. * The (PWR) LED will turn solid red to show the DA-Dongle is powered. it works very steady on Janguar Jaguar Land Rover, during programming, it will not lose communication. 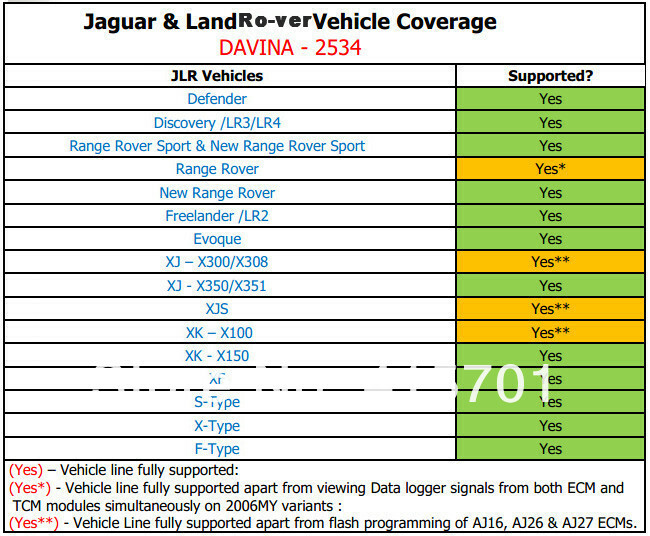 By now, DA-VINA 2534 is the best product for Jaguar Land Rover, but, it doesn't support the old Jaguar / LandRover. An old product, very possible, it will lose communication during programming. it can support some new Janguar / LandRover, but, not support all new Jaguar Land Rover in 2014. It will lose communication during programming. it can't support new Jaguar Land Rover in 2014.